WIPL-D Optimizer is a powerful multi-algorithm optimization tool that is being used by many successful professionals around the world. The tool calculates single solution as well as multiple solutions for complex/multi-criteria optimizations. Thanks to its simple and intuitive graphical interface, you can quickly solve the problem at hand. It enables a high level of design automation of an antenna, antenna system, scatterer, or a microwave circuit. WIPL-D Optimizer is integrated with WIPL-D Pro, WIPL-D Pro CAD and WIPL-D Microwave Pro. When you create your project and want to get optimum performance, you just start the Optimizer from within the design environment, set the parameters to be optimized and the optimization criteria, and let the tool do the rest. 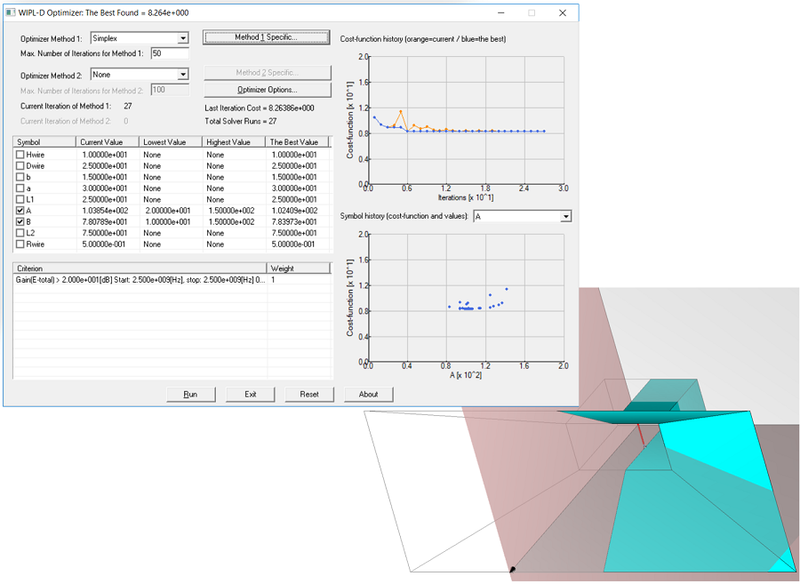 You can specify cost-functions based on virtually all the EM simulation results that are calculated with WIPL-D 3D EM solver, as well as circuit simulation results from WIPL-D Microwave. Various optimization algorithms are available. The selection covers all major methods proven to work efficiently in practice. The available optimization algorithms are: Particle Swarm, Genetic, Simplex, Random, Systematic Search, Simulated Annealing and Gradient. For more info, please check the following application note or brochure.